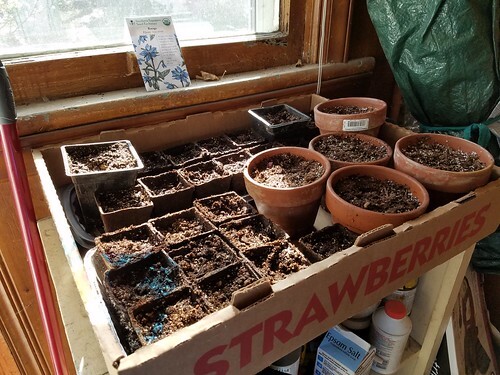 A couple of weeks ago I went to the Greensboro Permaculture Guild seed swap and met a young man who I have hired to prepare a circular bed for me to plant in this summer. He is well versed in permaculture and observed all the right things in the Back Forty. I feel lucky to have found him so it looks like I might not hurt myself getting my garden prepared this spring. I am a little obsessed with getting out of debt and getting my emergency savings back up to six months of salary but I’m not giving up travel and this seems well worth the expense. Hopefully if it all goes well I will hire him occasionally throughout the year to help with the tasks that tend to take me down physically. Our weather is still wacky here as it seems to be everywhere. I guess this is the new normal and the swings will continue to get worse. 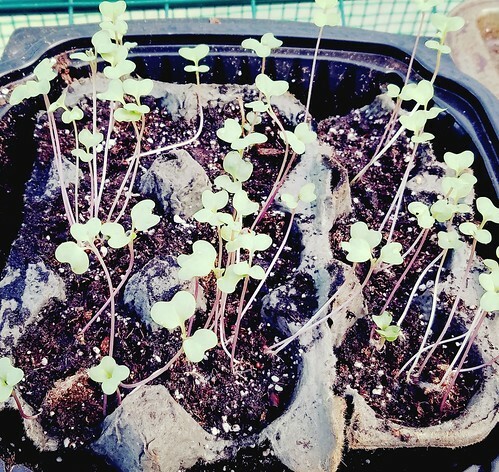 I started broccoli, Roma tomatoes, sweet banana and Carolina Wonder peppers, borage, and leeks inside, then moved them out to the greenhouse when it was warm. Yesterday I brought it everything but the broccoli since it froze last night. I heard that it snowed but I was asleep. We decided that it is time for the large silver maple close to the house to come down. It is leaning toward the house and it has woodpecker damage. 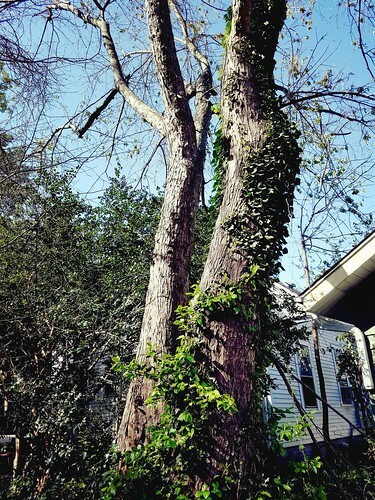 The arborist that trimmed it out the last time it dropped some big limbs and did some damage said that it might need to come down in a few years. However, we live in a historic district so I have to get a certificate of appropriateness from city staff to cut it down. I applied this past week. If we do this, the Back Forty should get more afternoon sunlight and I’ll get some wood chips for mulch. I saw two red bellied woodpeckers at work on the pecan tree next door this morning. Their name is all wrong because their heads are red, not their bellies. The seckel pear that I thought had died last year has strangely come back to life on just the bottom half. Justin will help me cut off the dead top half. 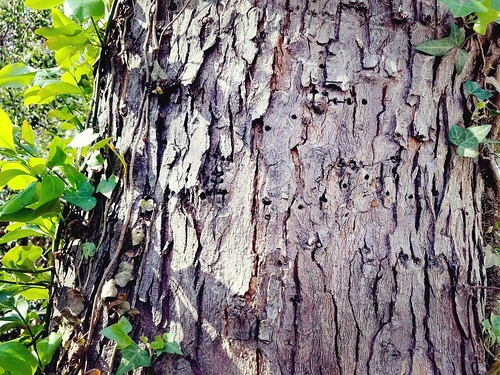 It may be that I’ll need to cut it down too if it is diseased. 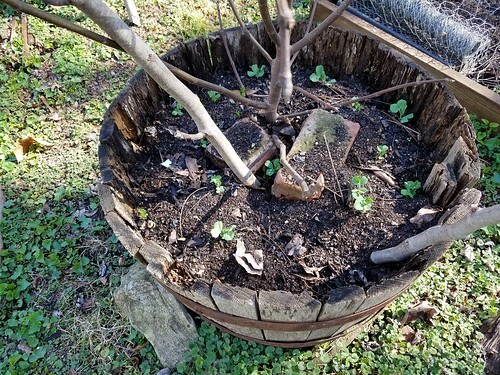 Many of the peas survived the woodchuck and squirrels digging in the raised bed and planters, but I have not seen any sign of life from the asparagus crowns I transplanted from the Wharton St. garden or the potatoes I planted a month ago. Foxgloves and black-eyed Susans are coming up in the space that will be re-activated and I’m going to move some of them to the front. The pineberries have survived and are blooming. 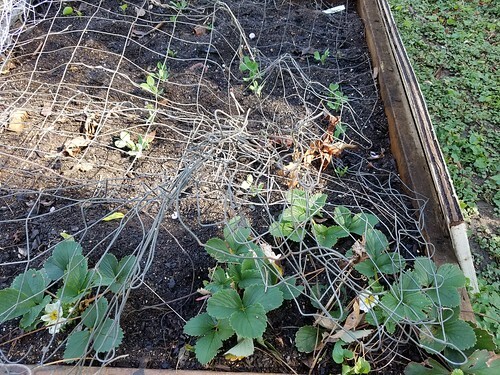 I covered the bed in wire fencing to save it from the woodchuck. I’m going to try to trap him soon. My neighbor has a hav-a-heart trap. We both tried to trap him last year with no success.